Before going further into the cavern, better facilities for lighting will have to be installed, for the darkness is dense and quite impenetrable for the average flashlight. In order to avoid being lost, wires are being strung from the entrance to all passageways leading directly to large chambers. How far this cavern extends no one can guess, but it is now the belief of many that what has already been explored is merely the “barracks” to use an American term, for the soldiers, and that far into the underworld will be found the main communal dwellings of the families. The perfect ventilation of the cavern, the steady draught that blows through, indicates that it has another outlet to the surface. “First, I would impress that the cavern is nearly inaccessible. The entrance is 1,486 feet down the sheer canyon wall. It is located on government land and no visitor will be allowed there under penalty of trespass. The scientists wish to work unmolested, without fear of hunters. A trip there would be fruitless, and the visitor would be sent on his way. The story of how I found the cavern has been related, but in a paragraph: I was journeying down the Colorado river in a boat, alone, looking for mineral. Some forty-two miles up the river from the El Tovar Crystal canyon, I saw on the east wall, stains in the sedimentary formation about 2000 feet above the river bed. There was no trail to this point, but I finally reached it with great difficulty. Above a shelf which hid it from view from the river, was the mouth of the cave. There are steps leading from the entrance some thirty yards to what was, at the time the cavern was inhabited, the level of the river. When I saw the chisel marks on the wall inside the entrance, I became interested, securing my gun and went in. During that trip I went back several hundred feet along the main passage, till I came to the crypt in which I discovered the mummies. One of these I stood up and photographed by flashlight. I gathered a number of relics, which I carried down the Colorado to Yuma, from whence I shipped them to Washington with details of the discovery. Following this the explorations were undertaken. Over a hundred feet from the entrance is the cross-hall, several hundred feet long, in which are found the idol, or image, of the people’s god, sitting cross-legged, with a lotus flower or lily in each hand. The cast of the face is oriental, and the carving shows a skillful hand, and the entire is remarkably well preserved, as is everything in this cavern. The idol most resembles Buddha, though the scientists are not certain as to what religious worship it represents. Taking into consideration everything found thus far, it is possible that this worship most resembles the ancient people of Thibet. Surrounding this idol are smaller images, some very beautiful in form; others crooked-necked and distorted shapes, symbolical, probably, of good and evil. There are two large cactus with protruding arms, one on each side of the dais on which the god squats. All this is carved out of hard rock resembling marble. In the opposite corner of this cross-hall were found tools of all descriptions, made of copper. These people undoubtedly knew the lost art of hardening this metal, which has been sought by chemists for centuries without result. On a bench running around the workroom was some charcoal and other material probably used in the process. There is also slag and stuff similar to matte, showing that these ancients smelted ores, but so far no trace of where or how this was done has been discovered, nor the origin or the ore. Among the other finds are vases or urns and cups of copper and gold, made very artistic in design. The pottery work includes enameled ware and glazed vessels. Another passageway leads to granaries such as found in oriental temples. They contain seeds of various kinds. One very large storehouse has not yet been entered, as it is twelve feet high and can be reached only from above. Two copper hooks extend on the edge, which indicates that some sort of ladder was attached. These granaries are rounded, as the materials of which they are constructed, I think, is a very hard cement. A gray metal is also found in this cavern, which puzzles the scientists, for it’s identity has not been established. It resembles platinum. Strewn promiscuously over the floor everywhere are what people call “cat’s eyes”, a yellow stone of no great value. each one is engraved with the head of the Malay type. On all of the urns, or walls over doorways, and tablets of stone which were found by the image, are the mysterious hieroglyphics, the key to which the Smithsonian Institute hopes yet to discover. The engraving on the tablets probably has something to do with the religion of the people. Similar hieroglyphics have been found in southern Arizona. Among the pictorial writings, only two animals are found. One is a prehistoric type. The tomb or crypt in which the mummies were found is one of the largest chambers, the walls slanting back at an angle of about 35 degrees. On these are tiers of mummies, each one occupying a separate hewn shelf. At the head of each is a small bench, on which is found copper cups and pieces of broken swords. Some of the mummies are covered in clay, and all are wrapped in a bark fabric. The urns or cups on the lower tiers are crude, while as the higher shelves are reached the urns are finer in design, showing a later stage of civilization. It is worthy of note that all the mummies examined so far have proved to be male, no children or females being buried here. This leads to the belief that this exterior section was the warrior’s barracks. One thing I have not spoken of , may be of interest. There is one chamber of the passageway to which is not ventilated, and when we approached it a deadly, snaky smell struck us. Our lights would not penetrate the gloom, and until stronger ones are available we will not know what the chamber contains. Some say snakes, but others boo-hoo this idea and think it may contain a deadly gas or chemicals used by the ancients. No sounds are heard, but it smells snaky just the same. The whole underground installation gives one of shaky nerves the creeps. The gloom is like a weight on one’s shoulders, and our flashlights and candles only make the darkness blacker. Imagination can revel in conjectures and ungodly daydreams back through the ages that have elapsed till the mind reels dizzily in space. You have just read the entire article of this find as printed in The Phoenix Gazette, dated Monday April 5th, 1909. As a footnote to this story I would like to tell you that I sent an inquiry to the Smithsonian regarding this particular article. I will post my letter to them but I unfortunately have thrown away their response. ( Why ? I don’t know. ) Below is the letter that I wrote to them and I will paraphrase their response. Recently I read a book by David Hatcher Childress entitled “Lost Cities of North and Central America”. All in all a most entertaining book. But there was one section of the book that truly intrigued me. 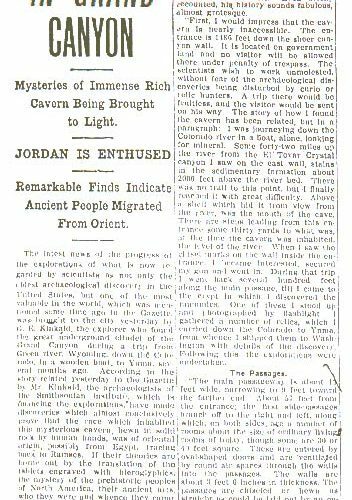 This is the section where he states confirming an article in The Phoenix Gazette dated April 5th, 1909 describing the finding of caves in the Grand Canyon by a Professor S.A. Jordan who was working under the directorship of the Smithsonian Institute. In this cave numerous Egyptian hieroglyphs and artifacts were found. He also stated that this area of The Grand Canyon is now off limits to all persons. As I’m sure you are familiar with this article the question I would like to pose is have you any additional information that would shed further light on this most intriguing find such as 1) Was there a Professor S.A. Jordan? 2) Did the Smithsonian do any work in The Grand Canyon around this time? 3) Who gave the rock formations around Ninety-Four Mile Creek and Trinity Creek their Egyptian names such as Temple of Ra, Tower of Set etc. and finally 4) Is this section of The Grand Canyon closed to the public due to dangerous caves. Since this article has nagged at me for over three years anything that you can add would be most appreciated. Oh and of course the question of what if anything was found in the caves? They first stated that over the years they had received many inquiries regarding this particular article and knew exactly what I was referring to. They then stated they knew of no G. E. Kinkaid or Professor S. A. Jordan. They admitted having worked in the Grand Canyon but that nothing like this had been found by them. They then stated that the strange Egyptian names for the peaks in this area were assigned by the original explorers because they liked Egypt and nothing more. They then further suggested that the article may have been an April Fools joke played by the paper. They did not suggest a reason the paper would have waited till April 5th as opposed to printing the article on April the First. They were strangely silent in answering my question of whether it was true that certain parts of the Grand Canyon were off limits to the public “due to dangerous caves”. I will leave it to you to speculate why this question was ignored. Ancient American’s editor, Wayne May, assures me the article is true and that he has proof in the form of letters written from this period. He has told me that Ancient American will publish an article about these finds in either issue # 31 or # 32. Be sure to look for it. Ancient American by the way is a great magazine that deals exclusively with discoveries in the Americas that predate Columbus. I presupposed that readers would be aware of the significance of the Egyptian names found in The Grand Canyon. I forgot that before reading “Lost Cities of North and Central America” by David Hatcher Childress, I didn’t even know that this area in question existed, so I will try to fill you all in by quoting from the words of David, himself. Just a quick note here, the folks at Adventures Unlimited have been kind enough to give me free reign to quote anything I want to from this book and for this I would like to express a big thank you. “Is the idea that ancient Egyptians came to the Arizona area in the ancient past so objectionable and preposterous that it must be covered up ? Perhaps the Smithsonian Institution is more interested in maintaining the status quo then(sic) rocking the boat with astonishing new discoveries that totally overturn the previously accepted academic teachings. Though the idea of the Smithsonian’s covering up a valuable archaeological find is difficult to accept for some, there is, sadly, a great deal of evidence to suggest that the Smithsonian Institution has knowingly covered up and “lost” important archaeological records. The Stonewatch Newsletter of the Gungywamp Society in Connecticut, which researches megalithic sites in New England, had a curious story in their Winter, 1992 issue(Vol. 10, No.3) about some stone coffins discovered in 1892 in Alabama which were sent to the Smithsonian Institution and then “lost.” According to the newsletter, the archaeologist Frederick J. Pohl wrote an intriguing letter on March 26, 1950 to the late Dr. T.C. Lethbridge. a British archaeologist. The letter from Pohl stated “A professor of geology sent me a reprint (of the) Smithsonian Institute “The Crumf Burial Cave” by Frank Burns, U.S. Geological Survey, from the report of the U.S. National Museum for 1892, pp 451-454, 1894. In the Crumf Cave, southern branch of the Warrior River, in Murphy’s Valley, Blount County, Alabama (accessible from Mobile Bay by river), were coffins of wood hollowed out by fire, aided by stone or copper chisels. Eight of these coffins were taken to the Smithsonian. They were about 7 1/2′ long, 14″ to 18″ wide, 6″ to 7″ deep. Lids open. “In an effort to find out where this vault of mummies and artifacts might be located, we went down to my mom’s bookstore and got a hiker’s map of the Grand Canyon. Pouring over the map, I was suddenly shocked to see that much of the area around Ninety-four Mile Creek and Trinity Creek had areas (rock formations, apparently) with names like Tower of Set, Tower of Ra, Horus Temple, Osiris Temple, and Isis Temple. In the Haunted Canyon area were such names as the Cheops Pyramid, The Buddha Cloister, Buddha Temple, Manu Temple and Shiva Temple. Was there any relationship between these places and the alleged Egyptian discoveries in the Grand Canyon? Indeed, this entire area with the Egyptian and Hindu place names in the Grand Canyon is a forbidden zone, no one is allowed into this large area. I don’t want to jump in here but I find it hard to believe that professional cave explorers, trained in exactly this sort of thing have been denied access to these sites. Surely, with trained professionals the dangers are minimal. So again I have to ask: Is it really the danger of the caves, or what might be found within, which keep these caves a closely guarded secret? He ends this particular chapter by the following. An interesting legend that has been reported about the Hopi is that of a Dark Star that will appear soon in the sky. This Dark Star will herald the end of the Fourth World, or Fourth Sun. The Hopi, like the Aztecs and Toltecs, divided the periods between catastrophes by “Suns” with which they named each epoch. The(re) was the Sun of Water, the Sun of Earth, the Sun of Wind, and our current age, the Sun of Fire. The end of the Sun of Fire will also be indicated by an unusual blue flower that will bloom in the desert. According to tribal reports, a strange blue flower, hitherto unknown, has been found in the desert regions of New Mexico. In order to give you a feel of the way in which his books are written I would like to quote his closing paragraph to this area in full. As I headed out of Sedona up Oak Creek Canyon toward Flagstaff, little did I know what new startling finds I was to discover. Sometimes Arizona seemed like another planet; pterodactyls, lost cities, gold treasure, weird tunnels and ancient ruins. It all seemed like a fantasy movie from the 50’s with lost continents, invading armies, horrific cults, living dinosaurs and fantastic lost treasure! Maybe it was all that — and more. With the sunset in front of me I steered my old pickup down the road and into the desert ahead. I hope I have peeked your curiosity, not only about David Hatcher Childress’ books but also, about the many mysteries that still await re-discovery. His books are all an “Adventure in Wonderland” and I can’t recommend them highly enough. Since I posted this it has been brought to my attention of another serious “oversight” by our great and wonderful Smithsonian. Well actually two. Many argue that the caves can’t exist because the Smithsonian would never “lie” to us. I will let what follows speak for itself. 1997: Chupacabra Captured In Texas ?! ?